We've previously reviewed Burson Audio products, always with very positive results. This is their first attempt to design a different kind of power amplifier, a new component which has to be faithful to the Burson Audio credo that can be summarized in three points: no use of IC's (integrated circuits), a less is more approach and solid state technology. During recent years many manufacturers have chosen Class D technology for their amplifiers, because of the higher efficiency, generally good sound and minimalist layout. The guys at Burson Audio think that IC's are the root of all evil so they tried to avoid Class D implementations like the plague. Actually, to be 100% precise, not every Class D amplifier is a chip-amp! So here it is: a fully discrete bipolar solid state power amplifier with a linear, beefy, traditional power supply. Made in Melbourne, Australia. By Australians. The Timekeeper is a compact 80+80 watts power amplifier that can be bridged to work as a monoblock, delivering 240 watts of muscular solid state power. In the first part of this review I'll concentrate my analysis on the Timekeeper used as a simple, standard stereo power amp. The monoblock option will be evaluated separately. While the front panel is minimalist as it can be (not even a power switch, just a small blue led!) the rear is crowded with connectors and switches: 2 x RCA line level input, 1 x RCA line level input (for RCA bridge mode), 1 x XLR input (for XLR bridge mode) and 2 x Stereo Speaker binding posts. Moreover, there's a rear firing cooling fan that switches on only under severe temperature conditions, a voltage switch (230/110 volts), the IEC socket, the on/off switch and a sliding switch for setting the unit in normal stereo mode, bridged RCA mode or bridged XLR mode. Since it is a compact yet powerful unit, heat dissipation might be a problem, for this reason the side panels of the cabinet are heatsinks themselves and the whole cabinet is made out of brushed aluminium. A small cooling fan (normally switched off) might kick in if room/unit temperature is too high. The inside is a masterpiece of clever and well-engineered layout. The power supply motherboard sits in the center of the cabinet, with its massive custom-designed 300VA toroidal transformer and six caps that ensure a max energy storage of 40,000uF. Here, Elna for Audio and Elna Slimic II are use throughout. Resistors are Vishay/Dale military grade with 1% tolerance. The power amp boards, one for each channel, are installed laterally, close to the heatsinks. 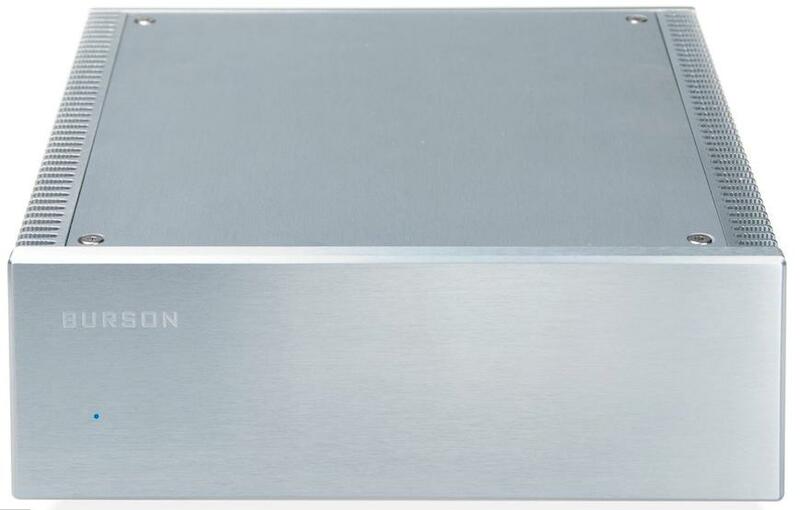 While many manufacturers try to exploit the benefits of modern chipsets and technologies, the guys at Burson Audio prefer to focus on a simple, good-old-days approach: this power amp makes no use of ICs or fancy circuit topology, it is a pure and simple all-discrete Class AB design. It is like a good old analogue timekeeper (errr, watch) when compared to modern digital clocks. These might be precise, energy efficient, lightweight and easy to use but sometimes lack the charme of a good old mechanical wristwatch. No, I'm not saying this amplifier sounds old fashioned! Only, there's something inherently right in its sound that reminds me the good solid state amplifiers of the past. Mark Levinson and Naim, just to name the first ones that come to my mind (and which I owned/loved). The tonal balance is just right and spot-on: a powerful, tuneful and deep bass range meets the mid and the treble range in a seamless way. There's no trace of artificial and unnatural boosts or cuts, everything sounds effortless and natural. Compared with modern top-end Class D amps it might lack a bit of transparency or precision, but this also means it even makes some of the worst recordings bearable. In the bass, this amp does an extremely good job, it has punch, extension and articulation in spades. Despite this strong performance there's still room for a certain velvet touch, which reminds me the bass performance of the Genesis GR180 power amp I reviewed a couple of years ago (equipped with Hypex modules). In the mid range its sound is clean and precise, with no trace of harshness. Male, female voices and even big choirs (e.g. Cantate Domino) appear natural and full bodied, making lyrics easy to follow and understand. Even electronically processed voices (e.g. Massive Attack's Teardrop) sound tolerable, thanks to this amp's low level of distortion. String instruments sound crisp, detailed and harmonically very rich. Certain percussions (for example, the snare drum) might sound easier on the ear than when played by top-end amplifiers. Sometimes...too easy. This is because the Timekeeper never tries to impress the listener with special effects. In the mid/high range the behavior is mostly the same: precision and detail in a velvet glove. Cymbals, for example, sound naturally metallic but never harsh. Trumpets might be shouty but listening fatigue remains extremely low. This, again, might be an effect of the low distortion levels, that help music flow effortlessly even when the going gets rough. Piano and keyboards benefit greatly from the harmonic richness of this amplifier. Used as a stand-alone stereo amplifier, the Timekeeper has still enough power and sheer energy to move even the laziest of speakers! Continuous power output is sufficient for most applications, because it's peak power to be impressive! This amp sounds dynamic and lively, even at very high listening levels, or when driving tough speaker loads. Be it hard rock or large orchestras, the Timekeeper seems to know how to deal with both: its energy reservoir is large enough to cope with the most severe and complex musical passages. Bass slam and punch are impressive and it would have been a miracle if the same energy and slam could be found in the mid range. As already noted, the snare drum, for example, has a slight lack of energy and its attacks are not as violent as they should be. By the way, one shouldn't forget the price range of the Timekeeper! Given the retail price its dynamic performance is simply amazing. Even at low listening levels it can still sound lively and entertaining, despite what one might think about classical and powerful solid state designs. You don't necessarily need tubes to get a good performance at extremely low listening levels! Pop and rock fans won't be disappointed, as the Timekeeper can sound impressively live when required. Just turn the volume up and enjoy the sound getting bigger and bigger, even to party levels. The imaging performance of the Timekeeper is extremely good overall and exceptionally good for the price. Depth and height of the stage appear slightly better than width, but certainly this amp can create a realistic and well focused soundstage. Its ability to sound correct and natural even at high listening levels helps avoiding the 3D image to collapse in the middle of the speakers. You can easily detect several horizontal planes of the virtual stage, so instruments and singers appear always distinct and well defined (if the recording allows that, of course!). Quality of crasftsmanship and finish are top notch, so I don't have any serious complaint to make. Everything is where it should be: connectors are reasonably spaced (and of good quality! ), the cabinet doesn't have sharp edges and even the bridging conversion is made extremely simple, so much that even a novice can't go wrong. The compact size of the cabinet is a plus, when the amp is used as a stand-alone unit. When using two as monoblocks, you are forced to stack one upon the other as they are too wide to be placed side by side (26.5 + 26.5 cm!). Considering how crowded the interior is, it would be impossible to reduce width even more. I've tested the amps in autumn/winter, room temperature was +23C: even at very high listening levels the rear coooling fan never kicked in. The amps become warm and that's all. Perhaps it might be different in Summer. Sound. 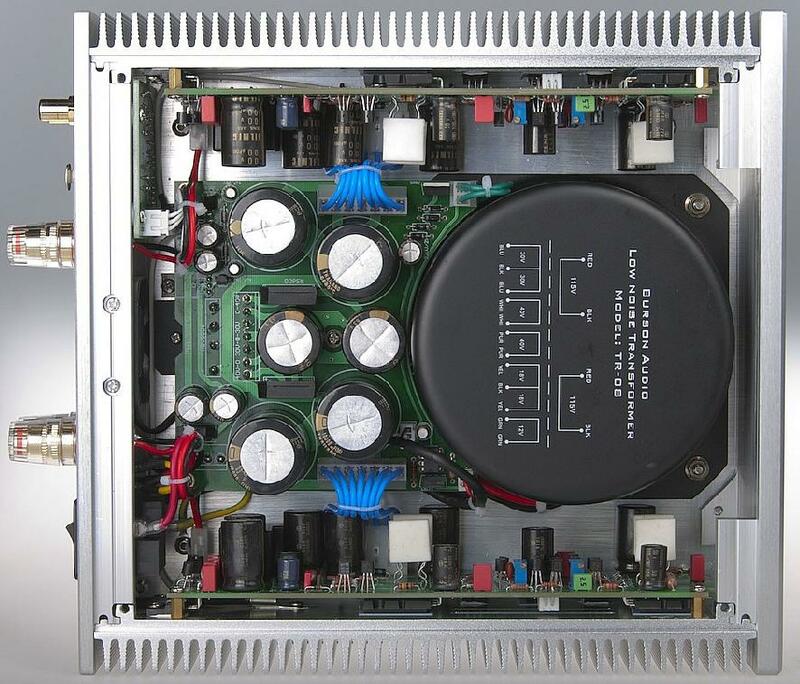 If you're a fan of classical Class AB amplifiers, you won't be disappointed. From my point of view, some extra energy and presence in the mid range would be welcomed. Moreover, not everyone might appreciate that slight velvet touch the Timekeeper has. This is a very interesting power amplifier: classical, solid sound, rich in harmonics, high in power output and low in distortion. The Timekeeper is a component that tends to disappear from the listening chain: it just does its job, effortlessly and naturally! In this price range it is a serious contender and certainly a power amp to keep in mind when you're in the market for a mature, well-engineered, powerful and precise performer. Like a good mechanical watch, it will keep the time of your favourite music for years and years. Kudos to Burson! In the second part of this review I'll tell you everything about the Timekeeper when used as a monoblock amplifier.